Workopolis Canada's largest career site for job seekers and a leader in HR technology for employers. Toronto's Grant Van Gameren has been called the city's hottest chef, but you could argue that this designation should be extended to the national level. As the co-owner of a slew of much-loved bars and restaurants (including Bar Isabel, Bar Raval, El Rey, Harry's Charbroiled Burgers, and PrettyUgly), Van Gameren is helping to set a new standard for restaurants in Toronto, one that puts as much importance on ambiance as it does food and service. Given his start, though, very few would have expected this kind of success - Van Gameren included. To find out how he managed it, and why he loves Spanish cuisine, we spoke to the man himself. Workopolis: How did you get started in the restaurant world? Van Gameren: Believe it or not, my first restaurant job was when I was 16, working at Pizza Pizza. I owe them all my success. Did you have a passion for food and restaurants growing up? Never. My childhood didn't revolve around food, and I didn't get into cooking because I wanted to cook. Up until my early twenties, it was just a job. You eventually moved to Il Fornello and then the more high-end Canoe in Toronto. That seems like a big jump. What was your motivation and what was that transition like? All my friends were graduating from university and college, and I started thinking about what I was doing with my life, where I was going. It was that point where I decided to dedicate myself to being a chef. At that time, Canoe was one of the top restaurants, so I applied there and got a job. I had opened a couple of Il Fornellos, and I had the sous chef for years, so I went in there with guns blazing, as if I was the most talented cook on earth. At Canoe, though, I realized that I knew nothing about food, and the breadth of it. It was a huge wake-up call, and I quickly realized that I was not nearly as good or experienced as most of the people working around me. From then on, I decided to base all aspects of my life around food; learning about it, and reading about it. You gained a lot of real-world experience to get where you are. What's your take on culinary school? Do you think that training is important for young chefs? I don't necessarily look at that as a prerequisite when hiring people. At the end of the day, we're looking for common sense and a good work ethic. So, if by chance, your culinary path took you through school, great, but it's about what you do in the real kitchen. What really matters is the learning environment you choose. I think it's a common misconception that you'll learn more by working in the best restaurant. That might be great for the resume, but it doesn't necessarily mean you're going to learn more. In some of the best restaurants of the world, you do the same tedious thing for two years before you get to do anything else. So, it's sometimes better for your career and development to work in a smaller, more intimate setting with the right people. You've had great success with Bar Isabel and Bar Raval, which have strong, obvious Spanish influences. What was it about Spain and Spanish cuisine that inspired you? I think the most common misconception is that good food and service is enough to make a successful restaurant. It's not, and this was really obvious when I went to Spain. It was an emotional experience actually, because it hit all the marks, as far as the social aspect of food, dining, and culture, and it really impacted me. It inspired me to not only focus on food and service, but also to create a stimulating environment. That's why at Bar Raval, most people have to stand. When you're standing, leaning, you're opening yourself to your guests and the rest of the restaurant. It's social. You're not contained to your barstool, or your quadrant of your table. People are happier, and sexier looking. They talk to strangers, they share food. It's important for people and places to take risks, and not necessarily conform to what everyone's used to. Mind you, you have to be strategic. You can't just transport anything from anywhere in the world, and expect it to work in Toronto. On the topic of taking risks, what can foodies expect from you in the future? We have a lot going on. 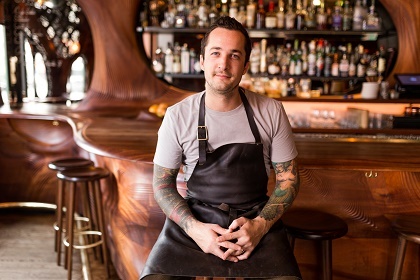 We're set to release Victor Dries, our new catering company, and the Tennessee Tavern in Parkdale, which will be an Eastern European bar and restaurant. Then we have a Mexican wood-burning restaurant opening at the end of the summer, where everything is cooked over fire. Now that you've had all these different projects and experiences, what do you think makes a good chef? I think that when you become a chef, you stop learning in a sense, or you don't really have anyone close to you to learn from. So, I think good chefs make sure that they're taking steps to evolve and stay open to new ideas. It's also very important that a chef, or anyone in the top position, recognizes how many people are working hard to create opportunities for their restaurant. This is an industry where people can take-take-take-take, so you need to reciprocate; helping your staff grow has to be a priority. That's something I take very seriously, and I'm constantly looking at ways to help people grow, whether it's to become a partner, or to start their own restaurant. On the flip side, what advice would you give to young Canadians looking to get into the industry? A lot of people have this misconception that if they cook for ten years, they're going to be a chef or own a restaurant, and the reality is far from that. It's not like other trades, where you compile a bunch of hours and you become a plumber or electrician. It's constantly evolving and you have to stay on top of it, otherwise you fold. The sad thing is that only the top per cent of the culinary field ever actually become successful chefs or restauranteurs. So, people need to really understand what motivates them, and what they're capable of. And then they have to follow through. That's the most important thing.